Harvard’s 1912 baseball team. 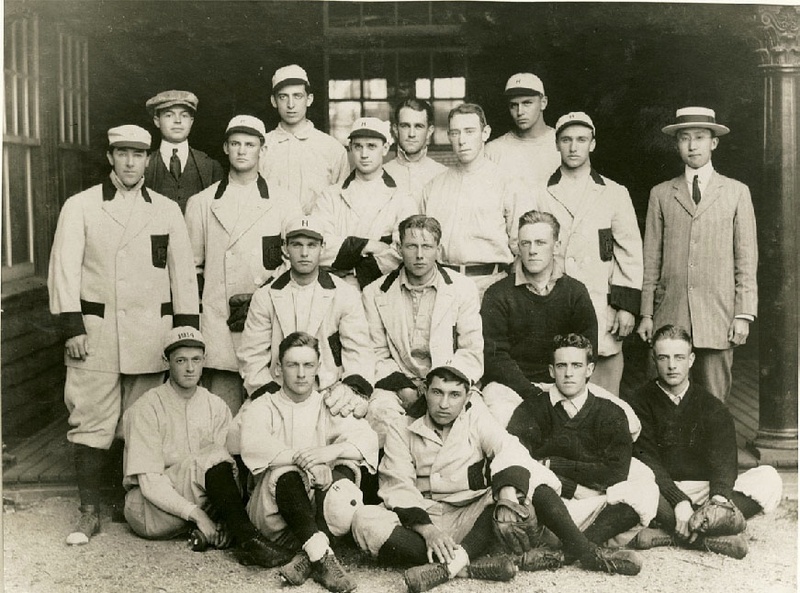 Wingate (front at left, holding cap) was Fenway’s first batter. Fenway’s first faithful shivered as a wicked wind whipped down Jersey Street. Though it was early April, the freezing temperatures and snow flurries were better suited for football. But nothing could deter the hard-core baseball fans huddled outside the ticket windows from getting their initial glimpse of the 1912 Boston Red Sox and their new, state-of-the-art ballpark. On April 9, 1912, just 11 days before their regular-season home opener against the New York Highlanders (who became the Yankees the following year), Boston’s team christened Fenway Park with the help of another squad sporting red socks—the Harvard Crimson. The brick façade that greeted ticket-buying fans looked much as it does today, but inside, Fenway was a work in progress. The left-field wall was still being erected, and crews were riveting wooden seats into the grandstand. The clubhouse wasn’t complete either, so players were forced to walk to the ballpark in uniform after dressing at the Park Riding School on the corner of Ipswich and Lansdowne Streets. The sparkling green diamond must have been a welcome sight for the Harvard varsity, finally released from the indoor cage in which they had practiced for most of the prior month. Despite the raw conditions and a late arrival from Cincinnati the night before, the Red Sox lineup included most of its regulars, including the fabled “Golden Outfield” of Duffy Lewis and Hall of Famers Harry Hooper and Tris Speaker. When the Sox took the soggy field at Fenway for the first time, there was no special ceremony, just enthusiastic cheers for Boston’s new manager/first baseman Jake Stahl and his squad. Pitcher Casey Hageman, fighting for a spot in the Red Sox rotation, started for Boston. At 3:30 p.m., third baseman Dana Joseph Paine Wingate, A.B. 1914, a Harvard sophomore, stepped up to the plate and into the history books as Fenway’s first batter. Hageman promptly fanned Wingate for the first of his nine strikeouts and retired the Crimson in order. Burly Sam Felton, A.B. 1913, a star kicker and end on Harvard’s powerhouse football team, shed his heavy, full-length fur coat and took the mound. After Hooper led off with a fly-out, second baseman Steve Yerkes followed with a single to right for Fenway’s first hit. The Red Sox loaded the bases in the bottom of the first but, in what would be a recurring pattern, failed to score. After setting down Harvard in order in the second inning, Hageman singled home shortstop Marty Krug to score Fenway’s first run. In the fifth, the Red Sox starter struck another RBI single to give his team a 2-0 lead. Meanwhile, the Crimson’s bats stayed as cold as the weather, giving the Harvard fans few opportunities to remove their hands from their coat pockets (except possibly to take surreptitious nips from flasks buried inside). Harvard finally got to Hageman in the fifth when captain Robert Potter, A.B. 1912, struck a well-placed single between short and third, but that would be the team’s only base hit of the afternoon. The closest the Crimson came to scoring occurred in the sixth when the centerfielder was cut down at the plate attempting to reach home on a double steal. By then, dusk was settling in, and the mud-caked ball became more difficult for fielders to pick up through the snowflakes. Fans were beginning to leave, and Hageman had the Harvard boys at his complete mercy as well. After the Crimson were retired in the seventh, Stahl signaled the umpire, and the game was called on account of the freezing temperatures, with the Red Sox besting their Cambridge guests 2-0. More recently, the Red Sox have regularly started their spring-training schedule by playing against Boston College and Northeastern. Perhaps it’s time for a rematch with Harvard as well. And this year the Red Sox are planning a range of celebrations for Fenway Park’s centennial, a milestone no other major league park has reached. There, on April 9, an event will commemorate the historic game with Harvard played a century ago. Christopher Klein is a freelance writer and the author of The Die-Hard Sports Fan’s Guide to Boston (Union Park Press).